Has everyone discovered the 1939 Register of England and Wales? Surprisingly, it doesn’t seem to be affected by the 100-year rule that prevents census returns being released for a century. At first glance, it doesn’t expose any secrets but … it could come in handy, especially in the early stages of research. The 1939 England and Wales Register, taken on 29th September, provides details of an estimated 40 million people residing in the country at the time. It was taken barely three weeks after Britain declared war on Germany and its allies, and was presumably the basis for the issuing of Identity Cards for all British residents. Here, for instance, is the 1939 entry for my father, at home with his parents, sister and brother. First gem – the actual dates of birth of everyone in the household – whilst I knew my father’s, I didn’t have those of his siblings, and had to buy birth certificates to get those of his parents – in my grandmother’s case, not as easy as it sounds. If I’d had access to this file, I could have been more confident in my searching. The first is almost certainly the date of her death, on that date in 1984. Perhaps the second date was her funeral? I can’t remember exactly when that was, though I was there. The extraordinary part, though, is that this paper record was unearthed and updated, by hand, more than 45 years after it was originally written. There are no other similar entries on that page, and my uncle’s and father’s deaths in 1990 and 1992 aren’t recorded – and nor are my grandparents’ in 1968 and 1972. Why was my aunt singled out? I doubt if I will ever know. The point I’m making, though, is that this register just might contain unexpected hidden treasure. At the very least, it’s worth taking a look. I’m overwhelmed by the response to my first blog post here, about some addresses jotted down in a notebook by my great-great-grandmother. Within months, I had been contacted by two descendants of the founder of the town of Holmesville, 90 miles north of Sydney in New South Wales; and by a new third cousin, who still lives near Wigan, in England, where my maternal grandmother originated. Thanks primarily to this new cousin, we may have pieced together most of the puzzle. Less than a year after Hannah’s death in 1850, her daughters Charlotte and Mary Ann were listed on the 1851 census as the daughters of Samuel Hill, a 43 year old weaver. In 1841, her son Levy had been recorded with the same Samuel and his parents (alas, relationships aren’t given in the 1841 census). 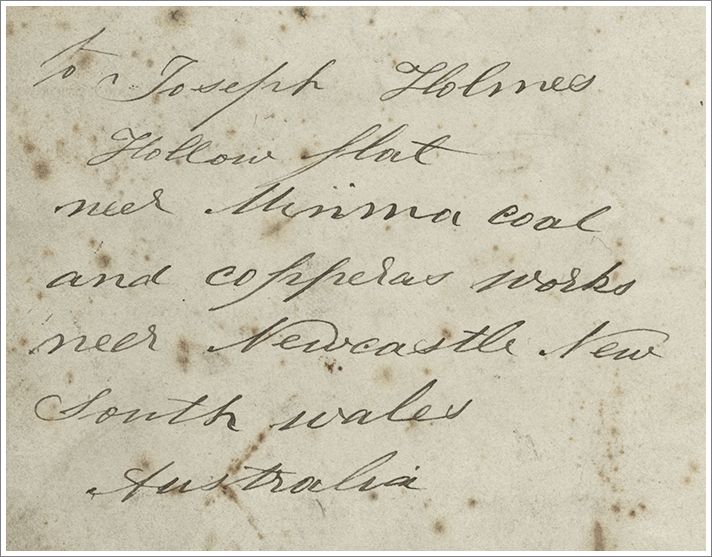 When Joseph arrived in Australia aboard the ‘Herald’ in 1856, he claimed his parents were Samuel and Hannah . Was Samuel his true father? If so, why did he not marry Hannah? Was he, perhaps, a cousin … or even an uncle? Hannah’s mother was Sally/ Sarah Hill: Samuel’s father was James Hill: could they have been brother and sister? But, if so, surely the girls would have been listed on the 1851 census as Samuels nieces, not daughters? 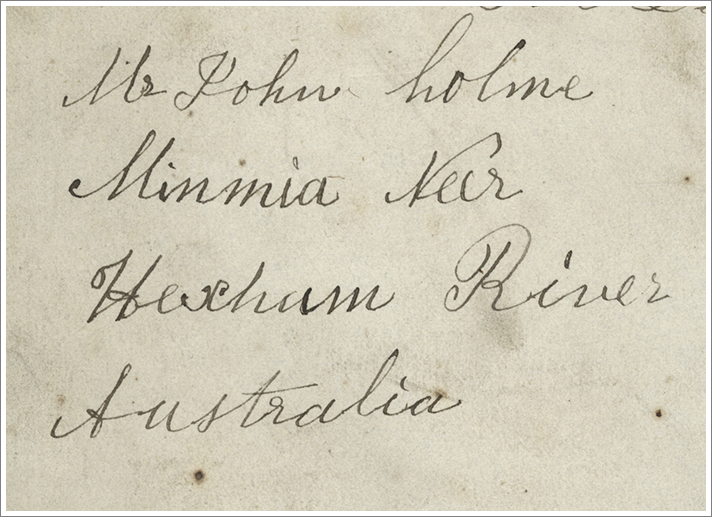 I also found the arrivals of John and Joseph in Australia on the ‘Herald’ in 1856, and Joseph paying the passage of his sister Mary Ann (also recorded in my gg-grandmother’s casting book) when she arrived aboard the ‘Scirocco‘ in 1863 or 1864. As I said at the end of that first post … isn’t t’internet wonderful? But … who is this previously-unknown grandchild, born in Shepherds Bush (London)? I’ve never heard of any Campbells in the family – and nor has my mother. The form is in my great-grandmother’s own handwriting, so there is no possibility of error. Of course, I took the obvious next step: I hunted for Harold Campbell on the 1901 census … and found him, with family, in Hammersmith (London). And then … that wonderful moment that comes to all family historians a few times in their lives when a whole pile of pieces of the jigsaw suddenly fall into place. My mother has a lovely old wooden “keepsake box” on top of her bureau. In it are old autograph books and newspaper cuttings, Christmas cards and letters. One of those letters has given us many hours of happily perplexed discussion. Dated 1899, and written on business headed paper to my grandmother (then aged 7), and signed “your loving sister Lisette“, it talks about “Albert” (presumably her son) who can “talk very plain now” and who “Is going to have a little Scotch suit and a little dirk or dagger“. Except my grandmother didn’t have a sister called Lisette! As far as I have been able to ascertain, she had three older sisters (my grandmother was the baby of the family, by quite a bit). Two (Elizabeth known as Beth, and Eliza, a.k.a. ‘Dollie‘) are accounted for – in photos and memories, registers and census returns. The third and oldest was Ellen. Born in Wigan in December 1876 and christened there a month later, Ellen appears with the rest of the family as a scholar, aged 4, on the 1881 census. Then … nothing. Missing, presumed dead. … or … it appears not. A quick search of the wonderful indexes at FreeBMD immediately turned up the marriage, at Chorlton (south Manchester) in the second quarter of 1899, of Helen Turner and Thomas Campbell. A year before the registration of Harold’s birth in Q2 of 1900 … and presumably a year or so after the birth of Albert. Oh dear. There is a possible birth of an Albert Harry Turner registered in Wigan in Q3 of 1897 – I guess I’ll have to buy the certificate. Watch this space! Adding enough background to give the context, without alienating or boring readers who might already have a good knowledge of the period is a perennial problem when writing a piece about past events. What was happening in the England of 1802? George III was on the throne, William Pitt the Younger had recently resigned as Tory Prime Minister; the French Revolution was a recent nightmare in the minds of many Englishmen. There was an uneasy truce in the war between England and France, soon to break out again with renewed bitterness. The threat of armed invasion was to hang over the country for some years; the battles of Trafalgar and Waterloo were still to be fought. Railways and steamships were inventions of the future. John Wesley had been dead only some ten years, and the churches he had founded were still very much a power in the land. The grandson of “The Unknown Prime Minister” Andrew Bonar Law visited me recently – his grandfather lived in my house just at the start of his parliamentary career. In preparation for his visit, I revised my notes – gleaned from various reference books – and, finding a few discrepancies, delved deeper. What I uncovered has led me to mistrust ‘facts’ in printed biographies, even (especially?) family-written ones. I have even – somewhat nervously – put my evidence forward to Wikipedia in order to have that article, at least, corrected, but so far have had no response. ABL was born in New Brunswick in 1858, the fourth son of a Protestant-Irish minister. His mother died a couple of years later, after the birth of his sister Mary. 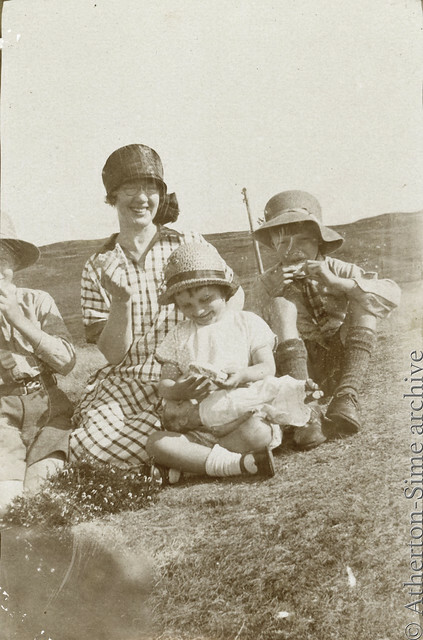 Aged 12, he came to Helensburgh to be raised by his mother’s prosperous relations – many of whom were childless. He entered the House of Commons in 1900 and his political career is well-documented, including his brief term (211 days) as Prime Minister in 1922-3 and his death later that year. after his mother’s death, her sister Janet came from Scotland to look after the family. In 1870, his father married the local school-teacher and Janet (there is a hint in some accounts of a swirl of offended skirts) took herself back to Scotland, taking Andrew with her to be raised by his Kidston relatives. Andrew left school at 16 and joined the family Bank: when it merged with the Clydesdale Bank in 1885, he would have been jobless, so the family bought him a partnership in an Iron Merchant’s business. Ten years later, he had amassed enough money to retire and enter politics. One of the first things I did when I bought this house a dozen years ago was to check the entries in the 1881 census – not available on the internet then, but I had invested in the CD version from the Mormon church. Somewhat to my surprise, I found ABL – aged 22 – living in six-roomed accommodation near Glasgow University with two sisters and a servant. His occupation was give as Iron Merchant’s Clerk. One sister was Mary, aged 20. The other was Janet, aged 14, and a scholar. Who could Janet’s mother be? She was born in 1867 – three years before his father was said to have remarried. And he was supposed to be a BANK clerk, only turning to the Iron Merchant business after 1885! One of the pleasant ways to support a charity is by attending a lunch. Usually, places are bought by the table or half-table by organisations and benefactors, so you are already in the company of friends or connections. One, though is different: the Women of Scotland lunch, now in its 56th year. Tickets are bought individually, and the seating plan (round tables of ten) is arranged by the organisers. At this event a few years ago I noticed that the lady of nearly my own age who was sitting opposite to me had the same surname as my mother. As we drifted to the exit doors, replete with good food, good speakers and good company, I found myself beside her and casually commented on the coincidence. The names rang a bell, but it wasn’t until I was speeding west on my homewards train that the penny dropped – Janey and Ellen were my mother’s cousins. If this lady was related to them, she was related to us, too. Tracing my mother’s family had hit a brick wall years ago. I found the baptism of her grandfather and the marriage of his parents fairly readily, along with their census record in Edinburgh in 1851. Beyond that … nothing, and I moved on to easier branches. Fortunately I had exchanged business cards with my lunchtime companion and fired off a near-hysterically excited email. A couple of weeks later she had extracted enough dates from her father to enable me to start buying certificates at the superb Scotland’s People website. Half an hour later (register and census records are viewed online, a snip at £1 each, unlike the laborious – and expensive – English system of waiting for full certificates to be posted individually at around £9.50 each) and I had the whole tree mapped out. Sometime around 1855 the family had upped sticks and moved across to Glasgow, where four more sons were born, in addition to another born in Edinburgh which I’d missed. Of course, the discovery produced as many questions as answers. My gg-grandfather registered the birth of his youngest son in 1864: in 1871, my gg-grandmother was recorded on the census as a widow: but repeated searches in both Scotland and England have failed to turn up a death registration for gg-grandfather. Where did he go? Was he, perhaps, in prison and my gg-grandmother preferred to pass herself off as a widow than admit to the shame of a criminal husband? If I ever find out, I’ll be sure to let you know. My grandmother’s family are not an easy lot to unravel. Her sisters (like many Victorian girls) seem to have delighted in pet-names, and matters are not improved by the naming of two successive daughters Elizabeth (in 1879) and Eliza (in 1881). My mother, now 90, has done her best to help. She is confident that Charles (the one born in 1874, not the one born in 1873 and buried in a public grave later that year) emigrated to the USA and lived in Atlantic City. Elizabeth – her ‘Auntie Beth’ – she remembers well, full of fun and frolics before her death at the age of 50. George, too, she remembers – born in 1885 and a merchant seaman, his first wife died and his two children were brought up in a seaman’s mission, although he married again and had another daughter who became a doctor. Who, though, was Auntie Dollie? Could she be Eliza, born 1881? … and there are school groups from the turn of the century (the OLD century, not the millennium!) when she was a pupil teacher (and Eliza would have been in her teens). 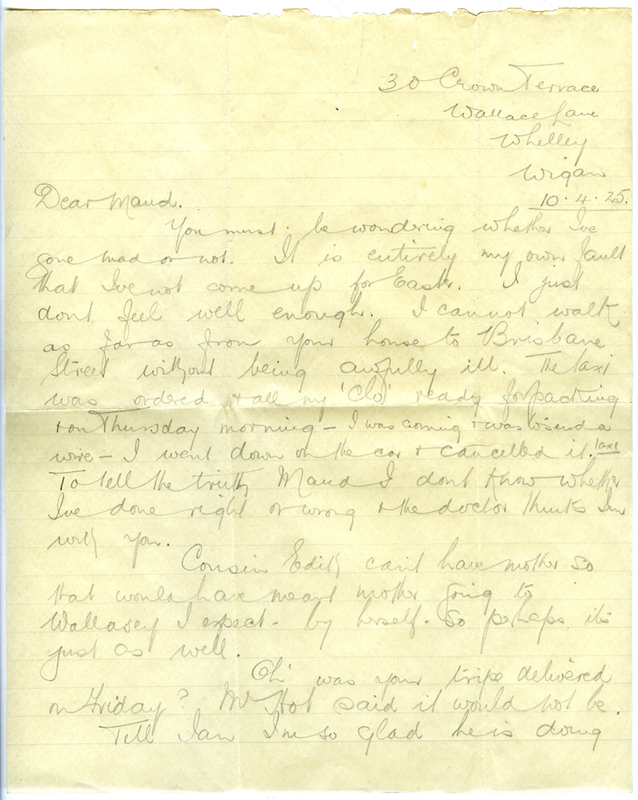 There is a somewhat breathless letter in 1925, cancelling – at short notice – an intended Easter trip to visit my grandmother in Greenock. 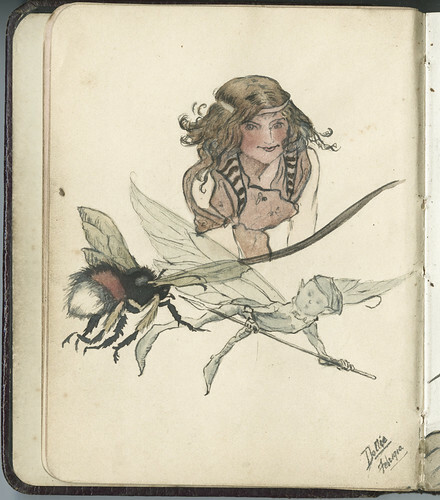 And there are some exquisite sketches in my grandmother and mother’s autograph books: this morning I gathered them all together into one set in Flickr. My mother has no actual memory of Auntie Dollie, so I have been assuming she died before my grandmother moved back to Liverpool in 1929 (my mother was then 7). A search of the English death registers, though – even for all Eliza Turners in all of England and Wales for the relevant years, and all Turners in Wigan likewise, have failed to turn up a death of a possible candidate of the right sort of age. And then occurred one of those magical strokes of luck. 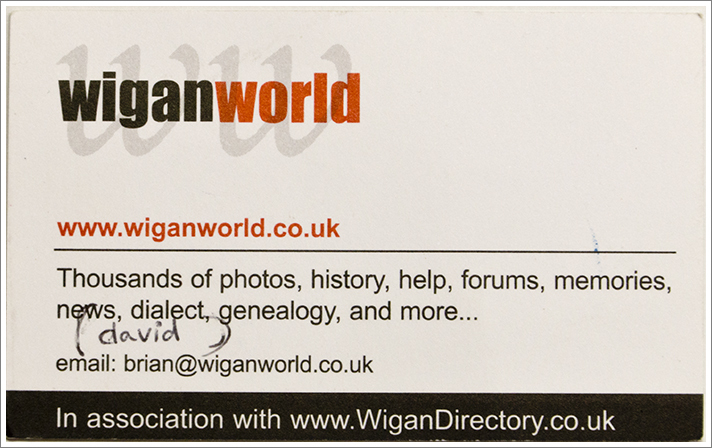 Whilst hunting for a phone number in my desk drawer this morning, I came across the business card of someone I must have met, oh, eight years ago on some foray to the Wigan History Shop with my daughters. This evening, I casually logged onto the wiganworld website. REALLY impressive – forums, photos … and indices. I tried first for Joseph Turner – my gg-grandfather – who was parish clerk in the 1850s, and instead found (in 1891) a young man of the same age as his son Joseph, tried for attempted murder and sentenced to ten years penal servitude. Gulp. There were, however, at least four Joseph Turners born around that time so hopefully this one isn’t ‘ours’! HOWEVER – and this is where things got a bit exciting – a search of the cemetery index revealed an Eliza Turner of the right age, buried in 1927. And the reason I couldn’t find her death in England? She died in GLASGOW – presumably on a visit to my grandmother. Minutes later, I had her record from the Scotlands People website – infinitely superior and far cheaper than the English system of applying for full-blown certificates. She died at 121 Hill Street, as did the architect Neil Burke Moir 30 years later, also of cancer. It is now the J D Kelly Building, housing part of the School of Art but I have a feeling it may have been a small private nursing home – I had some tests done in a building in Garnethill when I was a child. Was it the same one? So, finally, I have (probably) solved the mystery of Auntie Dollie. But – what’s this? Checking the details of the actual grave plot – it contains not only Eliza and her parents (my great-grandparents) but another infant, who was born barely four months before my grandmother and so can’t possibly be another sister. Who, then, can she be? I have ordered the certificate and must now wait, with bated breath, for its arrival in a week or two’s time. Naturally, I just HAD to search t’net for him: and much to my surprise, found a remarkably close match. It seems a suburb of Newcastle – north of Sydney – may have been named after him! Name Origin: The suburb took its name from Joseph Holmes an early land-holder and settler of the area. Early Land Grants: Portion 49 (Teralba Parish) granted to Joseph Holmes 19 February 1895. This 100 acre grant lay west of Apple Tree Road (formerly known as Minmi Road). Early Subdivisions: D.P.3442; 7/3/1898. Subdivision bounded by Elizabeth, William and Margaret Streets and Apple Tree Road. Part of Portion 49. Joseph Holmes divided IO acres of his grant into 250 allotments, which were sold at 20 pounds each (10 pound deposit, and 8% interest on quarterly balance). Early Settlers: Joseph Holmes and his wife Mary, although not among the very early settlers of the area, were important to the town’s development The Holmes’ settled with their large family on 10 acres at “Holy Flat“, Estelville. The family kept a dairy and supplied Minmi with milk. Joseph worked in the mines. It is believed that he and his son Samuel introduced a method for top-holing and firing coal to Seaham No. I Colliery. The Holmes also derived an income from their land and building dealings. So, then, what relation was Joseph to my gg-g’ma Ellen? In 1851, Ellen (now married to a coal-miner, James Miller) is living in Marsh Green, a hamlet on the edge of Pemberton near Wigan. Nearby (according to the 1851 census) a Joseph Holmes, 19-year-old coal-miner, is lodging at the ‘Duke of York’, The head of the household is Simon Miller – ‘Victualler and Coal Miner’, living with his wife, son (yet another coal-miner) and daughter. I believe Simon was the brother of Ellen’s husband, and named his daughter Cicely after their mother. HER maiden name was Melling: and another lodger was Thomas Melling, aged 26: – perhaps her nephew? Also lodging with them were Levy (15) and Samuel Holmes (24). Could all three be brothers or cousins of Ellen? There are two other links with New South Wales.